Life Of Riley will not be winning out of turn if he claims top honours in the Shadwell Stud/EBF Stallions Harry Rosebery Stakes at Ayr. The Showcasing colt has been set some stiff tasks since opening his account at Ripon in the spring, but has largely performed well in defeat. Karl Burke’s charge was only narrowly denied at Listed success at Sandown in July before finding only an on-song Rumble Inthejungle too strong in the Molecomb Stakes at Goodwood. The form of his latest effort when fourth in the Ripon Champion Two Yrs Old Trophy could hardly have worked out better, too. The winner of that race, Sporting Chance, landed a French Group Three on Monday, while the fifth home, Barbill, triumphed in a valuable sales race at the Curragh the previous afternoon. Life Of Riley is certainly capable of winning at Listed level and this looks a fine opportunity for him to do just that. Listed honours are also up for grabs in the Al Maktoum Cup Arran Scottish Fillies’ Sprint Stakes and with conditions to suit, the vote goes to the Michael Dods-trained Intense Romance. The four-year-old has really flourished since returning from a two-month break, finishing second on her Carlisle comeback before chasing home subsequent Doncaster winner Global Applause at Sandown. She devoured the Haydock mud when scoring with a little up her sleeve a couple of weeks ago and it is no surprise connections are going in search of some valuable black type on her favoured soft ground. 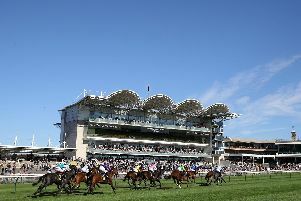 Red Mist catches the eye in thee feature event at Newbury,the Dubai Duty Free Cup. Trained by the bang-in-form Simon Crisford, this son of Frankel was not beaten far in the Champagne Stakes at Doncaster this time last year and is enjoying a fine three-year-old campaign. A demolition job at Kempton in June was followed by two really creditable runs in good company in France. He made the most of having his sights lowered when bolting up at Ripon a few weeks ago and with further progress likely, there is every chance he can make his presence felt in Berkshire. Earlier in the afternoon Alfred Boucher is of significant interest in the British Stallion Studs EBF Maiden Stakes. Trainer by Henry Candy, the grey finished fourth at Nottingham on his only previous start and the race has worked out tremendously well. The winner, True Mason, has since been placed at Group Two and Group One level and is bound for Saturday’s Mill Reef Stakes. The runner-up, Autumn Splendour, is no mug either having achieved a rating of 88 with two subsequent wins. It is over three months since that Nottingham novice event, but provided Alfred Boucher is fit enough to do himself justice after the break, he must be considered a serious contender. Moorlands George rates the best bet over the jumps at Newton Abbot. In four previous visits to the Devon circuit, Jeremy Scott’s veteran has won once and finished third on the other three occasions. He has clearly had his problems as he was sidelined for the best part of 18 months before finishing second at Wincanton April and he has not been seen in competitive action since. However, at least that effort proved he goes well fresh and having had a wind operation in the meantime, this could be the time to catch him. AYR: 1.30 Archies Lad, 2.00 City Tour, 2.30 Glorious Charmer, 3.05 LIFE OF RILEY (NAP), 3.55 Intense Romance, 4.10 Breathless Times, 4.45 Arrowtown, 5.20 Gamesters Icon. BALLINROBE: 3.30 Viscount Wilson, 4.00 Holiday Winner, 4.35 She’s Made It, 5.10 Biddy The Boss, 5.40 Rain In Spain, 6.10 Montalbano, 6.40 Sam King, 7.10 Chead Solas. DUNDALK: 6.00 Geological, 6.30 Dubai Rainbow, 7.00 Beau Satchel, 7.30 Cityman, 8.00 Nimitz, 8.30 Conclusion, 9.00 Touch Of Gold. NEWBURY: 1.10 Alfred Boucher, 1.45 Breath Of Air, 2.20 Not So Sleepy, 2.50 Lonely Boy, 3.25 Beat Le Bon, 3.55 Red Mist, 4.30 Ice Gala, 5.05 Armed. NEWCASTLE: 5.50 Tuff Rock, 6.20 Richard Strauss, 6.50 Dancin Boy, 7.20 Soumei, 7.50 Bedwyyah, 8.20 Suppressor, 8.50 Kibaar, 9.20 Brendan. NEWTON ABBOT: 2.10 Heydour, 2.40 Moorlands George, 3.15 River Bray, 3.45 Go On Mayson, 4.20 Highway One O One, 4.55 Gamain.